Interest rates have been on the rise in Canada since June 2017 and the general consensus is that they will continue to go up. What will this mean to the average client’s portfolio? Of course, everyone knows that rising interest rates are bad for bonds, right? In reality, history shows a different conclusion concerning the impact of rising interest rates on a broadly diversified bond portfolio. When analyzing the past experience of bond investors under different interest rate scenarios it is clear that a bear market in bonds is quite different from a bear market in stocks. Unlike stocks, where the common definition of a bear market is a 20% decline in prices, to most investors a bear market in bonds is simply a period of negative returns. The past 49 years of return data shows that these periods are few and far between with only 5 calendar years of negative performance. The chart below shows that increases in interest rates at the short end of the yield curve have not necessarily hurt most bond portfolios. Since 1970 there have been 22 years (including 2018 year-to-date; where bonds still managed to achieve a gain) when short-term or 91 day T-Bill yields have increased over the previous year. 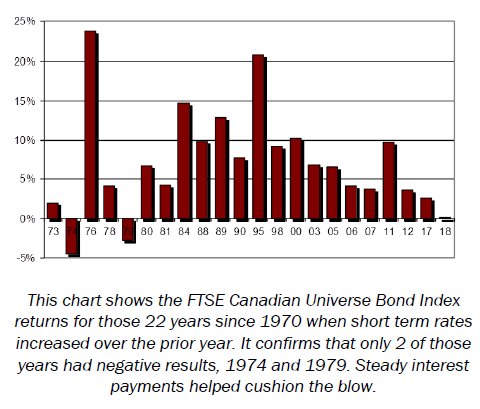 The chart shows the calendar year performance for the FTSE Universe Bond Index, the broadest and most widely used measure of government and corporate bonds in Canada, for the years when short-term rates increased. 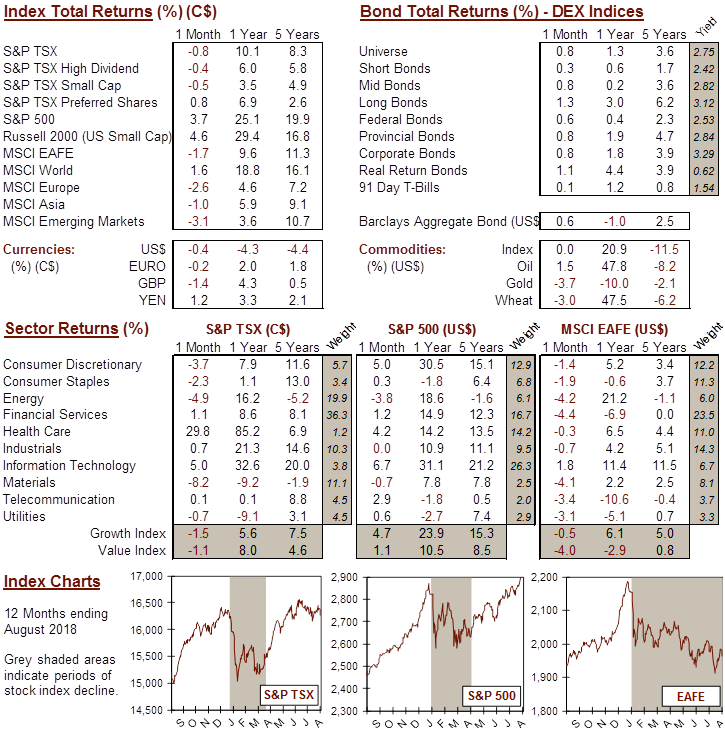 The first point of note is that there are only 2 years with negative results; 1974 and 1979, and the -4.5% return in 1974 was the worst annual bond performance of the last 40 years. The average annual performance over the 22 years was 7.0% which is only slightly less than the 8.7% average annual return over the last 5 decades. Even when rates are rising across the maturity spectrum, it is unusual to suffer large losses in bonds. When both short-term and longer-term rates increase together it is more likely that bonds will see low or slightly negative performance. As the data to the left illustrates, periods in which short-term rates increased between 1 and 3% had a positive impact on bond results. 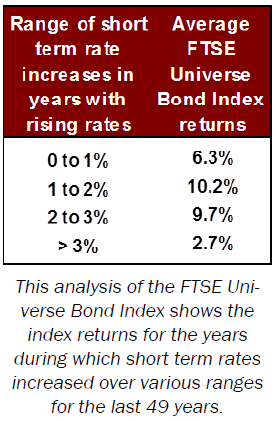 Even during periods when short rates were rising at a rate of greater than 3% (which only occurred 3 times), bond investors still managed to realize positive returns on average. Since the Bank of Canada’s priority is to keep inflation low, the likelihood of the Bank triggering a surge in interest rates is not very high. Most diversified, long term investors should not view weakness in the bond market with the same apprehension as an equity bear market. In general, investors should look to bonds for stable income and to protect against disaster, something which they did well during the financial crisis. Bonds are an asset class capable of storing value, providing liquidity and most importantly, providing positive returns in most economic environments. Interest rates hikes don’t automatically spell disaster for bonds. Most investors own bonds in order to preserve capital and mitigate the volatility inherent in stocks or other risky assets. In a world where equities are becoming more expensive, maintaining exposure to bonds is a wise move. Ultimately, most bond investors are likely to be best served by sustaining their strategic allocation to fixed income. While short-term bond returns may not be overly impressive at the moment investors will be more than satisfied during the next equity bear market. Disaster? Unlikely.